(Nanowerk News) In the quantum world of light, being distinguishable means staying lonely. Only those photons that are indistinguishable can wind up in a pair, through what is called Hong-Ou-Mandel interference. This subtle quantum effect has been successfully imaged for the first time by two doctoral students from the Faculty of Physics at the University of Warsaw. Physicists have long known that photons can become bunched together. However, technological limitations have prevented the phenomenon from actually being observed directly. Only recently has this feat been achieved by two doctoral students from the Faculty of Physics at the University of Warsaw (UW). In an article just published in the renowned optical journal Optics Letters ("Shot-by-shot imaging of Hong–Ou–Mandel interference with an intensified sCMOS camera"), Michal Jachura and Radoslaw Chrapkiewicz presented a film sequence clearly showing photons forming pairs. Under certain conditions, two individual, indistinguishable photons will form a pair as a result of interference. This subtle quantum effect has been successfully imaged for the first time by Michal Jachura and Radoslaw Chrapkiewicz, doctoral students at the UW Faculty of Physics (both shown here, in multiple copies and grouped into pairs on both sides of the measuring apparatus). "We are the first to have filmed individual photons in a very interesting situation, 'pairing off' as a consequence of an effect known as Hong-Ou-Mandel two-photon interference," says doctoral student Michal Jachura. He playfully expands upon this 'matrimonial' metaphor: "When carrying out our experiment we felt a bit like paparazzi. We were wielding an advanced camera of the latest generation, the exclusive 'venue' was the world of quantum mechanics, and the 'celebrities' we wanted to capture in the act were individual photons." Interference is a phenomenon that can be observed when any wave - be it a light wave, a sound wave, or otherwise - passes through a barrier with more than one aperture (an experiment first carried out by the British physicist Thomas Young). Each aperture then acts as the source of a new wave, and a characteristic pattern of interference fringes forms on the other side of the screen placed behind the barrier. In the case of light waves, we see bright fringes where the wavefronts reinforce one another, and dark fringes where they cancel each other out. Objects in the quantum world are characterized by a certain surprising property: they may behave either like particles or like waves, depending on how we observe them. If an individual photon behaves like a wave, it can pass through two apertures at the same time and interference fringes will form on the other side of the barrier (in other words, the single photon will interfere with itself). But such interference is only observed if the measurement system does not allow us to ascertain which aperture the photon passed through. If we make it possible to do so (for instance by placing a polarizing plate behind one of the apertures), the photon will immediately behave like a particle and the interference fringes disappear. In 1987, a group of physicists from the University of Rochester (UR) predicted and observed a subtle quantum effect in an experimental setup involving a beam-splitting plate, which transmits some of the light that falls on it and reflects the remainder. The parameters of the plate can be chosen so that the probability of a given photon being reflected is equal to the probability of its passing through. If one photon is sent towards the plate from one side and another photon from the other side, there are four possible outcomes: both photons may be reflected, both transmitted, one of the photons may be reflected while the other is transmitted, or vice versa. The quantum-mechanical calculations performed by the UR physicists indicated that these various scenarios do indeed occur, but only when the photons impinging the plate are distinguishable, which means they are behaving like particles. But if the photons remain indistinguishable, interference will occur between them. As a result, the two photons become bunched into a pair and always appear together, on one side of the plate or the other. "The Hong-Ou-Mandel effect had been observed before, but only by using photodiodes, which simply signaled the detection of a photon by sending out an electrical impulse. We were much better equipped, having at our disposal a highly advanced camera built by our research group. This camera, a bit similar to night-vision goggles, consists of an ultra-modern image intensifier and a very sensitive and a low-noise, fast sCMOS sensor. It proved to be so good that we were able to study the behavior of individual particles of light and managed to film their quantum interference," says doctoral student Radoslaw Chrapkiewicz, stressing that the camera design team also included Wojciech Wasilewski, PhD, and Jaroslaw Iwaszkiewicz, Eng. (both from the UW Faculty of Physics). Using the camera and image intensifier, the UW Physics researchers managed to film the behavior of photons in two situations: when the photons being sent towards the beam-splitting plate were distinguishable and indistinguishable. In the former case the sequence of images shows individual green spots, which represent individual photons being registered, appearing randomly on opposite sides of the plate or together on one side or the other. But the moment the physicists purposefully eliminated the distinguishability, the photons immediately joined together in pairs and left the beam-splitting plate always on the same side, never separately. "Managing to film two-photon interference is a very important result for quantum optics, as it means that from now on physicists will be able to directly observe spatial optical phenomena that involve single photons," stresses Prof. Tomasz Matulewicz, director of the Institute of Experimental Physics at the UW Faculty of Physics. 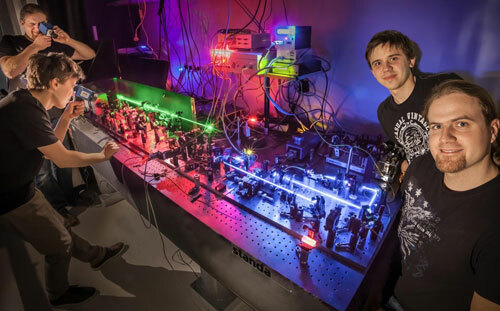 This research achievement, made possible by a PRELUDIUM grant from Poland's National Science Centre, represents an important step towards developing efficient methods of detecting quantum states of light and building super-resolution optical microscopes of a new type, capable of registering images using a small number of photons, therefore fully safe to use even with very delicate samples.